The servo motor that arrived in the post is considerably smaller than the one I used in the test set-up. Its’ small size means that the prism can stand on its triangular face comfortably. The servo motor is first secured onto a base using a housing I built out of cardboard. It is wired to the Arduino and both sit side-by-side under a platform inserted into the bottom of the box. I am yet to find a more satisfactory way to mount the prism onto the servo’s rotating platform. The background area is now much smaller. The light source (LEDs) are yet to be inserted to the right side of the box (I am going to try out some very bright LEDs: 24000 mcd and wired these up to the circuit using copper conductive tape). 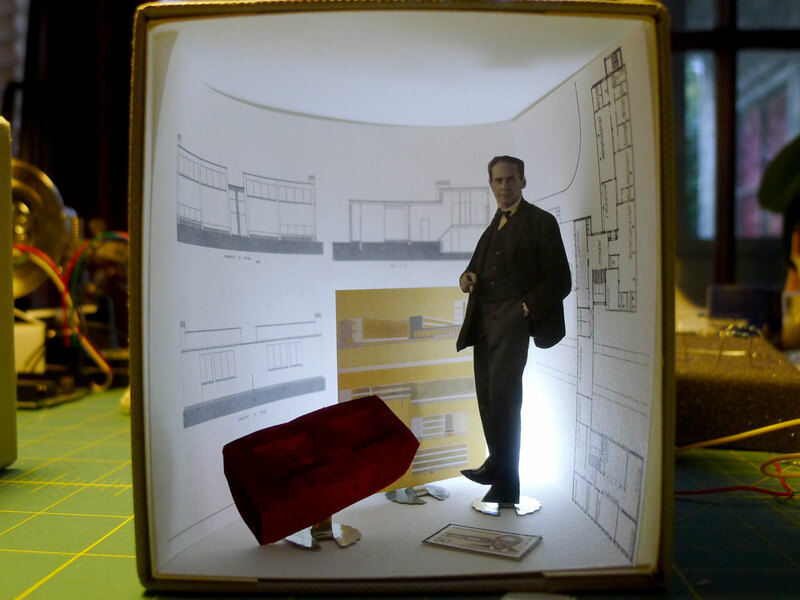 Rather than a preconceived plan, the design of this diorama arrived through a process of playing with the components and materials at hand. A uOLED screen shows animated views of ‘the first direct observation of the orbital structure of an excited hydrogen atom, made using a newly developed “quantum microscope”‘ captured by Aneta Stodolna of the FOM Institute for Atomic and Molecular Physic and her colleagues in 2013. 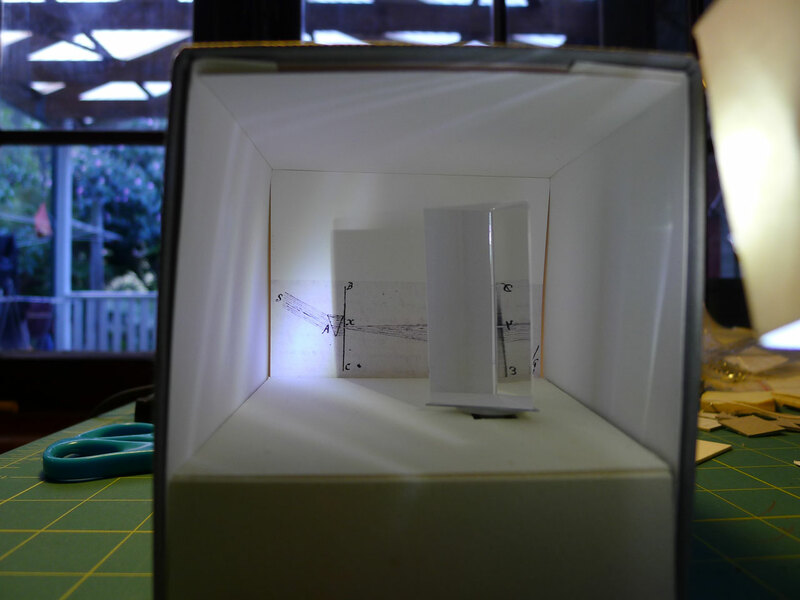 The screen’s edges and its mounting holes are masked by the box’s casing which is made out of a silver cardboard, reflecting the light from the screen. At the front is a board with a double convex lens mounted at the same height as the screen. Peering through one can see the ‘excited hydrogen atom’ on the electronic screen. How the front board is fitted to the box is yet to be perfected. Mirroring the first diorama is the the last. 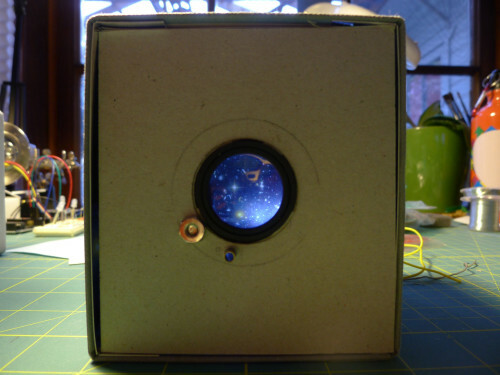 I had some different ideas about how to contain the observable universe in a box. The Hubble Telescope (which turned 25 April this year) has taken some amazing photographs, which I was hoping to make use of. After a number of different trials of different models, I decided that the simplest is the best – I am going to use the same photograph of the observable universe (taken by Hubble) that I started with. The photograph is printed on printable tracing paper to allow the 10mm diffuse white LED to evenly light the image. 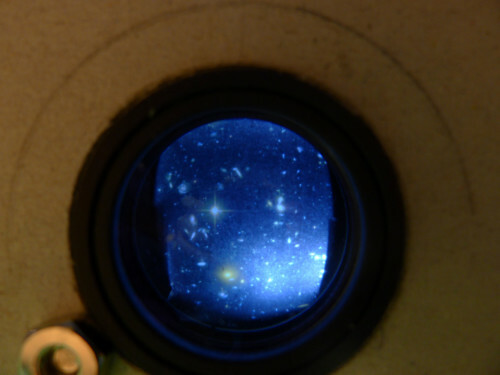 Like diorama01, viewers look at the image through a lens, but this one is a double concave lens making the observable universe appears much further away. So this last box will look very similar to the first. I am considering adding a simple Arduino circuit to light the image, adding a sense of movement and time. Again, the physical finish is to be finessed. This is human scale. It is interesting and significant that the chemistry data textbook has chosen these objects as examples. Thinking about these standards, modern architecture came to mind. Walter Gropius thus becomes the standard man with the average height and his Bauhaus building in Dessau becomes the standard modern building. This diorama set up is very simple with Gropius’s drawings of the Bauhaus (printed on thin Kozo/ printable Japanese paper) creating a curved background. The standard brick, the man himself, and his coloured rendering of the design lining the fore-, mid- and background respectively. 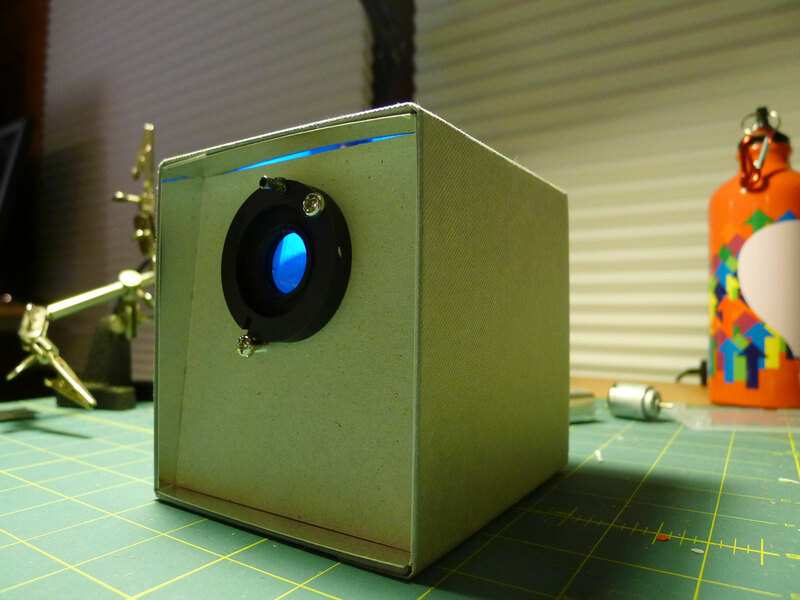 The box will be lit from the back with a superbright 10mm white LED.